Congradulations on such a high score! To tell the truth when I was much younger this game was my life at the arcade. After I broke the 4.5 million mark in the 80's, it fell into my memories. I never thought there would've been a record keeping for this, which is cool! My strategy was to remember when the toughest patterns repeated on each of the sectors and then be ready for it. As the story goes, a player challenged me to a duel, I played and quickly lost my first unit, he played and ran his score pretty high and then when I got my second unit, it just went on and on, the other player eventually left and the scene was much like Flynn in the movie as other gamers saw the score as it went higher and higher, cheering and oohing all the way. It's exciting to see the game is still around and played. From one master to another, I give you my greatest respect for having a world record higher than my own earlier achievements, TRoN Rules!! KLuWolF Wrote:Congradulations on such a high score! To tell the truth when I was much younger this game was my life at the arcade. After I broke the 4.5 million mark in the 80's, it fell into my memories. I never thought there would've been a record keeping for this, which is cool! My strategy was to remember when the toughest patterns repeated on each of the sectors and then be ready for it. As the story goes, a player challenged me to a duel, I played and quickly lost my first unit, he played and ran his score pretty high and then when I got my second unit, it just went on and on, the other player eventually left and the scene was much like Flynn in the movie as other gamers saw the score as it went higher and higher, cheering and oohing all the way. It's exciting to see the game is still around and played. From one master to another, I give you my greatest respect for having a world record higher than my own earlier achievements, TRoN Rules!! It's great to know that there are other's around that can talk about what it's like to score that high at an arcade. Around the time that I found out about Twin Galaxies, I got my Tron Arcade machine. I didn't remember my old patterns and didn't think I could get good again, but it didn't take long before I learned how to really play again. It would be really great if you have access to a Tron arcade machine or live next to someone who owns one. Tron will always be my favorite and most special game. The world record on Tron has reached over 7 million. The final score was 7,148.220. The game was stopped due to the arcade closing. I know it's been a while since I said I would try for 10 million points, but I think I am ready to give it a good try. dctron Wrote:The world record on Tron has reached over 7 million. Way to go DCTron! Good job! Wow! Congratulations! Your score is almost twice as high as 2nd place. That's incredible. It was on June 2, 2006. I've been busy with other things, but I am going to try to break the record again soon. My User plays the Tron arcade machine almost everyday. His highest score is about 45,000. 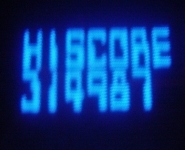 With the release of Tron Legacy, there has been a lot of interest in the Tron Arcade world record. On July 31, 2011 a new world record has been set after 23 hours of game play. I don't understand the 24 tokens thing, though. Couldn't someone just put in 50, 100, or 1000 or however many tokens it takes to accumulate 14 million? The number of tokens is a ranking based on the number of scores entered for that game. It has nothing to do with how many tokens it takes to get a score since each game is a single credit only game. No continues allowed. Okay, admittedly my 153K I set last night on our local arcade's TRON machine is not quite world record level, but I still had fun doing it. #3 on our local machine. 14 million. Wow. I just found out about this yesterday while doing some research. I had no idea. Amazing. I'm up to 78k. How do you get the bits to appear? It seems inconsistent.